WARRENTON, Mo.—Sen. Claire McCaskill (D., Mo.) says her comment that "normal people can afford" to own private planes was a joke taken "out of context." McCaskill's comment came during her town hall swing through Missouri over the Senate's August recess, in which she is trying to "understand the frustrations of people in the rural parts of the state"—something she says the Democratic Party has "done a bad job at." Her statement on private planes came during an appearance in Dunklin County, in Missouri's "Bootheel," where the median household income is just over $31,000 and more than a quarter of the population is in poverty, according to the Census Bureau. 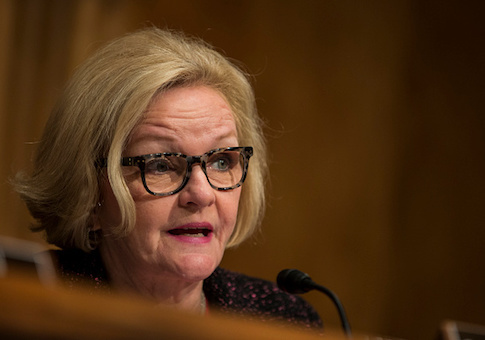 It came after an attendee who was a pilot asked McCaskill whether she was in favor of privatizing air traffic control. "He was just a regular guy and he has a small airplane," McCaskill told the Washington Free Beacon after a town hall on Wednesday. "I was speaking to his concern that … it was going to be way too expensive for some folks to be able to use their small airplanes." The man told McCaskill that the "freedom to fly around" is currently "affordable" for a "normal person," to which she responded, "Will you remind [them] that when they come after me about my husband's private plane? That normal people can afford it?" McCaskill was making a reference to a political scandal from six years ago that is apparently still fresh on her mind. In 2011, it was revealed she had improperly used $76,000 worth of Senate funds for travel on her own private plane. She also failed to pay $287,000 in property taxes. It became such a headache that she convinced her husband "to sell the damn plane" for $1.9 million, a price her spokesman said lost her $200,000. McCaskill said her comment about her husband's plane was a "joke" that is being used "out of context" by Republicans, who have returned to calling her "Air Claire." Asked whether she thinks normal people own private planes, McCaskill said, "of course not." Though McCaskill's husband was convinced to sell the "damn plane" in 2011, he bought a new one after she won reelection the next year—and it was actually an upgrade. The eleven-seat 2009 Pilatus PC-12 47E is valued on McCaskill's official financial disclosure at over $1 million. The 2009 model sells for over $4 million, according to the company's website. McCaskill has earned criticism from not only Republicans, but also from her liberal primary opponent Angelica Earl. "I consider myself to be a normal person, and I want to assure you that I cannot afford a private plane," said the 31-year-old Earl, who was recently laid off from her job. Michael Ahrens, a spokesperson for the Republican National Committee, said he was not surprised McCaskill wasn't taking responsibility for her comment. "As always, it’s never Claire McCaskill’s fault when she gets caught saying or doing something controversial," Ahrens said in an email. "She blamed her husband when she failed to pay over $300,000 in state taxes on their last private plane, she blamed Twitter when she lied about never meeting the Russian ambassador, and she even threw her own daughter under the bus when the family’s donation to Planned Parenthood became public," Ahrens said. This entry was posted in Politics and tagged Claire McCaskill. Bookmark the permalink.